The EPH-22 series is equipped with Yamaha’s newly developed 8mm (3/8”) driver unit fitted with a powerful neodymium magnet and precision tangential edge. These features give the earphones the ability to deliver a full bass sound at any volume despite their compact size. The housing, which is based on the same basic structure and uses that same materials as Yamaha’s high-end EPH models, is designed for complete audio fidelity. Just as you would expect from a musical instrument manufacturer such as Yamaha, the EPH-22 series earphones deliver total music listening pleasure. The EPH-22 series is characterized by a simple design decorated only with Yamaha’s distinctive tuning fork logo on the outer flat side of the housings. Each model is finished with an elegant and refined gloss coat, making these earphones an accessory that you will want to use and treasure for years to come. Choose from three beautiful colors. Due to their compact size, the EPH-22 series earphones can be worn in comfort. What’s more, Yamaha’s 2Way Ear Supporter allows the earphones to be worn in two different ways – either with the cord over the ear for a more securely fixed position (as shown in style 1), or in the regular way (style 2). The 2Way Ear Supporter is made of a flexible elastomer material, ensuring a snug fit in the ear canal, enabling you to listen to music comfortably and carefree. 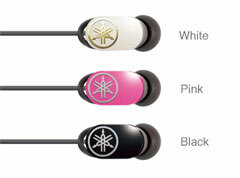 Style 1 : When the chord passes through from the top, the earphones can be worn securely and comfortably. 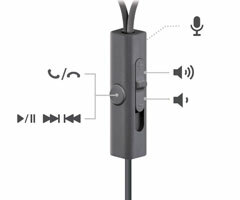 Style 2 : When the chord passes through from the bottom, the earphones can be easily and quickly fitted in the usual way. The EPH-R22 is supplied with a remote control that lets you take calls on a connected iOS or Android device. Playback and stop can also be controlled with just the touch of a single button, and volume can be precisely adjusted using an analog-style volume controller.